Ooyama’s past isn’t gone into beyond that he obviously had an unhappy one, although it’s hinted that he was really lonely. When Ooyama finds out how the world works, he doesn’t want to straighten out his previous life, and doesn’t mind living in the world he doesn’t have to think. Chaa, in his former life, was part of a forbidden love with a girl he still loves. We see the scene where Yuri decides that Tachibana is God’s representative and must be killed. Yuri is holding the principal hostage, and Tachibana tells her to knock off, he’s not the highest authority in the world, she is. Whether that’s true, or just so Tachibana could protect the principal, who knows. Yuri observes Tachibana’s abilities, declares them unnatural, and uses that as further ‘evidence’ of being God’s representative. Tachibana also admits that she prefers to avoid murder unless there is no other option, an important note of Tachibana’s character. At this point, despite Yuri’s description of the ‘npcs’ around the school, the characters have yet to meet any ‘npcs’. Hinata originally thought Ooyama was one, but when he asked him, turns out he was human too. Could it be all the people of the world are human? While I think that’s unlikely, at this point I’m going to label Yuri as an unreliable narrator. She doesn’t understand the world as well as she appeared in the first episode, and the novel brings this out. Also, the novel shows that she’s a lot more crazy then she appears in the anime. 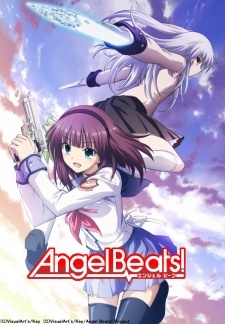 I haven’t checked the novels out for Angel Beats, but I should check it out in between studying for finals (and yes, I’m still behind in Angel Beats, sadly). I found it interesting that the principal had been held hostage many times before Chaa or Yuri’s attempt. That means Tachibana has been around protecting everyone for a long time considering she had to develop her “skills”. Kinda makes you wonder what type of psychos preceded the SSS. Although I’d wager all the (alluded to) previous attempts were solo acts. Yuri’s distinction is her insight to form a team. I agree Yuri is more extreme in the novel.